Selling For Sale By Owner in NYC makes a ton of sense when you consider the alternative: paying 6% commission to a NYC real estate broker. Listing For Sale by Owner in NYC is a straightforward process if you have patience and spend some time learning about how the FSBO process works. In this article, we offer NYC FSBO sellers an overview of how they’d go about selling For Sale by Owner in NYC. Why Should I Sell for Sale by Owner in NYC? What Are the Steps for Selling for Sale by Owner in NYC? What Are Some Tricks to Save Money on My Home Purchase in NYC? To figure out why it makes sense to list For Sale by Owner in NYC, let’s first figure out exactly what value is added by your typical NYC listing agent. NYC listing agents have the ability to post your listing onto the local broker database called the REBNY Listing Service (RLS). This is a very important marketing tool for your listing, since over 90% of buyers are represented by agents who almost exclusively use RLS to search for properties. However, as a For Sale by Owner seller in NYC there’s no need to pay 6% in commission just so your home can be listed on RLS. Our NYC Flat Fee RLS package will list your home on the RLS and over a dozen sites like the New York Times, Brownstoner, Agorafy and StreetEasy for zero percent commission. An experienced NYC listing agent will presumably have some basic knowledge about your building and area. It’s nice to work with a knowledgeable agent, but is that worth paying over $100,000? A typical home owner and For Sale by Owner seller in NYC will have significantly greater knowledge about his/her unit, building and neighborhood than a listing agent who may only have one other listing in your area! Your typical NYC listing agent will have plenty of time to show your home to prospective buyers and buyers’ agents, even on short notice. But one of the key requirements of selling For Sale by Owner in NYC is that you, the seller, have time to show your apartment. Therefore, it makes very little sense to justify paying 6% on the grounds that the NYC listing agent will have time to show your property! It’s true that any experienced agent will have good experience in the art of negotiation between buyers and sellers. However, is the benefit of having an experienced negotiator worth paying $100,000 in commissions? It’s not exactly the case that buyers/sellers overpay or underpay in today’s market. Supply and demand ultimately set your listing’s sale price. It’s highly unlikely that negotiation will give you a tangible benefit worth over $100,000. Not to mention, if you are fortunate enough to be a NYC home owner surely it must mean that you are a successful individual who is somewhat skilled in negotiating as well! It’s true that board packages (aka purchase applications) in NYC, especially for coops, can be rather complex. At the same time, filling one out is not rocket science. They may be long applications (in some cases 40 pages or more), but the information they ask for is not exactly like taking the SAT verbal section. Most of the application involves transferring numbers and information from other sources, like financial statements, onto the purchase application. Is it worth paying a broker $100,000 just so they can fill out an application for you. Not to mention, if you really need some assistance on the board package you can just pay a broker by the hour to help you with the application. Note: In NYC the buyer is responsible for filling out the board application since the buyer is the applicant. If the buyer has an agent, the buyer’s agent will typically provide guidance to the buyer on how to best approach the purchase application. The listing agent will typically review the finished board package before it is submitted to the managing agent. Once the managing agent checks the application for completion, it will be forwarded onto the co-op board for review. If you are selling For Sale By Owner in NYC, you may want to double check the application yourself before letting it be submitted to the building. It comes as no surprise that most NYC FSBO sellers are very hands-on individuals. As such, most if not all of them have been studying the market and comparable sales for quite some time before officially deciding to sell. If you’d like a second opinion on your pricing, one great strategy is to contact a few of those listing agents who have been sending you post cards over the years. They will prepare a CMA for your property. Ask each of them to send you a pricing analysis of your home. This is one area where many unsuccessful old school FSBO sellers of the past have stumbled. Cleaning and properly staging your home so that you can take professional photos is one of the most essential parts of the For Sale by Owner process in NYC. There’s a reason why every single listing by a traditional agent has impeccable photos. A picture is worth a thousand words. Your listing will be competing against all of the agent managed listings in NYC which have world class real estate photos. We’ve seen far too many confused NYC FSBO sellers who say no to professional photography so they can save a few hundred dollars. It comes as no surprise that many of these FSBO sellers fail. They ultimately end up hiring an agent, who promptly drops the price and pays for professional photos. The listing eventually sells, however the financial damage to the seller (lower price & 6% commission) is astounding. A home sale is one of the most important financial transactions of a person’s life. Therefore, it should be treated as such. No For Sale by Owner seller in NYC should ever begin the process without having learned more about how the market operates. Our blog has a wealth of knowledge about how the real estate market in NYC actually works. You can also learn more about your property via a plethora of useful real estate websites for NYC. By educating yourself about the process, you will be able to more easily debunk the common lies told by real estate agents, properly set your expectations, and be prepared for every step from accepting an offer and all the way through the closing process in NYC. For condo or co-op FSBO sellers in NYC, it’s also important to educate yourself about your building’s policies for sales and also request the relevant documentation which you will need to provide prospective purchasers. By having these policies and documents in advance, you will be able to more quickly move forward and complete the NYC For Sale by Owner sale process. Hire a professional photographer. Don’t be that confused “old school” FSBO seller with dark photos of a disorganized living room. As we’ve said before, there’s a reason why not one single listing agent in all of NYC who is worth hiring would ever post a property without professional photos. Your nest egg is at stake here, and in times like this it’s okay to invest a few hundred dollars to increase your FSBO success rate. If common sense wasn’t persuasive enough, here’s another reason why you should invest in professional photos: many investors and vulture buyers specifically target FSBO sellers who don’t appear to know what they are doing because it means that these sellers may sell for a below market price. One dead giveaway that a FSBO seller hasn’t done his or her homework is if the listing has DIY photos or it isn’t posted on RLS. Having a floor plan on your listing is also a requirement if you are expecting buyers to take your listing seriously. If you don’t include a floor plan, you will confuse buyers. 50% of buyers today will not physically go see a property unless they have first seen a floor plan online according to a recent national survey. Furthermore, we regularly hear of buyers and agents who will refuse to view a property until they can review a floor plan. Properly syndicating your listing onto RLS, the New York Times, Zillow, StreetEasy and additional sites by using a NYC Flat Fee MLS package is the single most important thing you must do as a NYC FSBO seller. Why is this so important? Having the correct listing marketing exposure to buyers equates to having more buyers see your listing. If more buyers see your listing, you will by definition receive more inquiries, more offers and hopefully a higher sale price. If you are looking to achieve the best possible sale price, simply listing your home on one website is akin to shooting yourself in the foot. Over 90% of buyers are represented by agents who do not show listings that aren’t in the RLS. Therefore, if you aren’t listed in RLS you are only exposing your listing to 10% of the total buyer base! 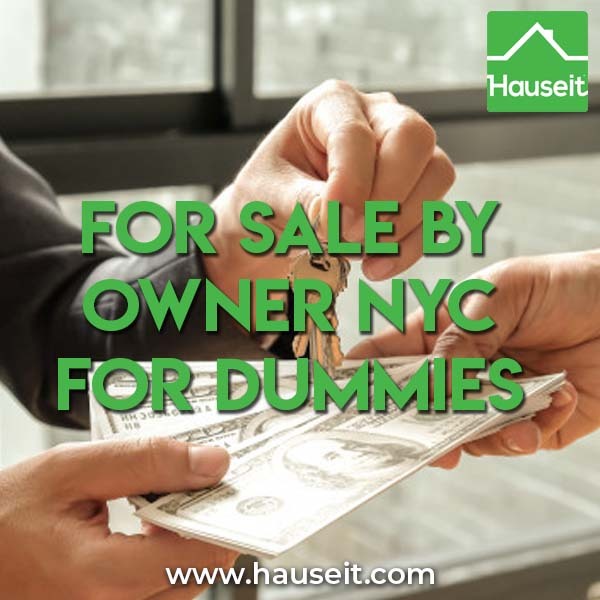 Hauseit’s For Sale By Owner listing package offers an inexpensive way to appear in the city’s broker databases and on every real estate website that matters for unrepresented buyers such as Brownstoner, the New York Times, Agorafy, StreetEasy and dozens more. A key benefit of listing For Sale by Owner in NYC is that you will have the ability to show your own home and answer questions. No agent will know your home better than you. As such, you are the perfect person to speak with interested parties to describe the unit, building and neighborhood. If you’d like to have a professional run your open houses, we offer two complimentary open houses with our NYC Flat Fee RLS listing package. Alternatively, we offer busier home sellers the option to list with a brand name, full service listing agent for just 1% in commission. At some point during the process, you will likely begin receiving offers on your property. A thorough offer submission should come with an offer submission form, proof of funds, pre-approval or pre-qualification letter (if financing) and a completed REBNY financial statement. It’s also suggested but not required to request the buyer’s attorney contact information as well as a short biography of the purchaser. As the seller, it is your responsibility to thoroughly review all offers and follow-up with various parties to offer feedback and counter offer (if applicable). Once you’ve accepted an offer, it’s critical that you hire a professional and responsive real estate lawyer. You don’t want your sale to be held up because your lawyer doesn’t use email and constantly asks the more adept buyer’s attorney to fax documents all day long. If you don’t already have a lawyer lined up, we recommend asking these questions when interviewing a real estate attorney. We’d be happy to provide you with referrals as well, just contact us! Once contract is signed, your focus will turn to the coop or condo purchase application. If your buyer is represented by an agent, you can expect the buyer’s agent to take the lead on preparing this for his or her buyer. If your buyer is unrepresented, it will be your responsibility as the New York City FSBO seller to assist him or her with the application. If at any point you need professional assistance, you can always get guidance through our professional broker consulting service. Yes. NYC home buyers can earn $20,000 or more at closing through a rebate of the buyer’s agent fee if they work with a Hauseit affiliated buyer’s agent. All of our partner brokerages are brand name, traditional real estate companies with great relationships with the wider broker community. Our partner brokers never openly discount and no one will know you are getting a better deal! Discretion is extremely important if you are choosing to receive a buyer’s broker commission rebate in NYC. Think about it, won’t there naturally be resentment from both the seller and the seller’s agent if they know you are getting a rebate? The only way to avoid jeopardizing your deal is to work with a brand name, highly rated real estate broker who does not normally discount their services. 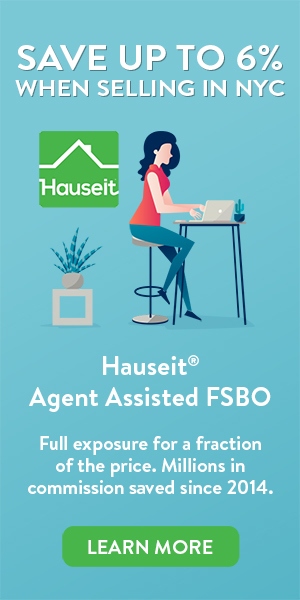 Through Hauseit, you’ll be able to work with a real broker and truly get the real thing, plus a hefty discreet gift at closing! It’ll be our little secret!